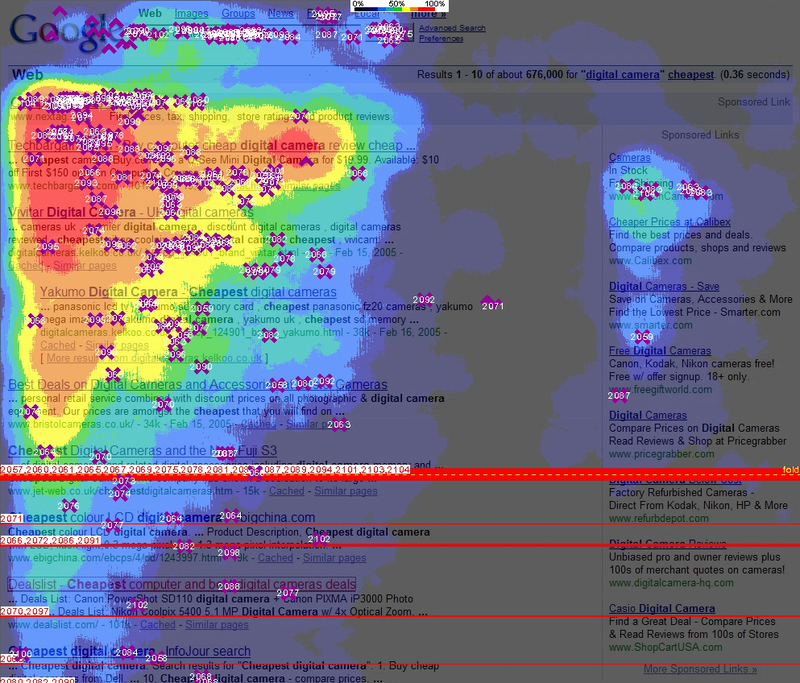 This visual heat map suggests how web searchers navigate scan the search results shown on Google pages and which areas on the Google web page tend to get the maximum attention. The areas highlighted in red are noticed by almost Google user but the visibility decreases drastically for search results that show up below the fold (i.e., search results at position 5 or below). Like the letter “F”, human eyes read the content at the top in a horizontal manner and then travel vertically along the left side of the results. Most of the Google ads in the right sidebar largely go unnoticed (compared to the top organic search results) while the reverse is true for the horizontal Google ad unit placed at the top of search results – it probably offers the highest conversion rate for advertisers. Full details of this Google Eyetracking study is available on Eyetools.